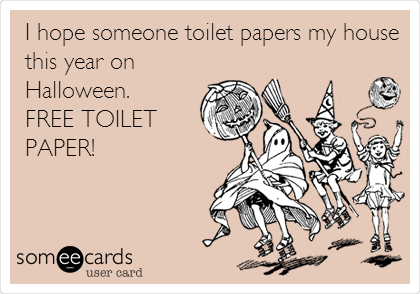 There are some hilarious Halloween memes out there and I’ve taken the painstaking task, upon myself, to collect these gems for all you little sippers. Grab your favourite bevvy and enjoy some laughs on my behalf! What a cardinal idea! 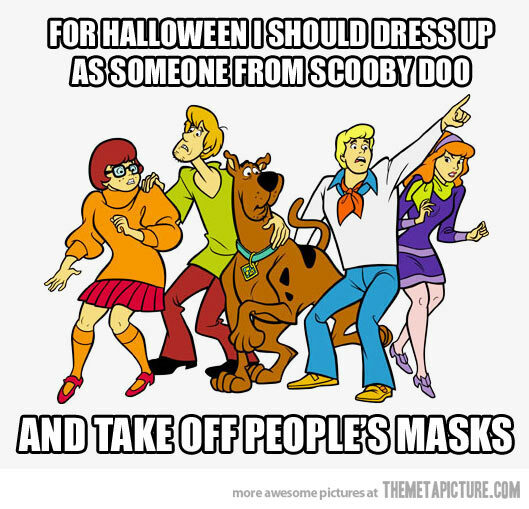 Imagine all the times you’d hear, “And I would have gotten away with it all, if it wasn’t for you meddling kids!” Now you just have to decide which member of the Scooby Gang to go as. Fred’s ascot creates too many questions, as does Shaggy’s drug addiction. I guess this one goes to the dogs! 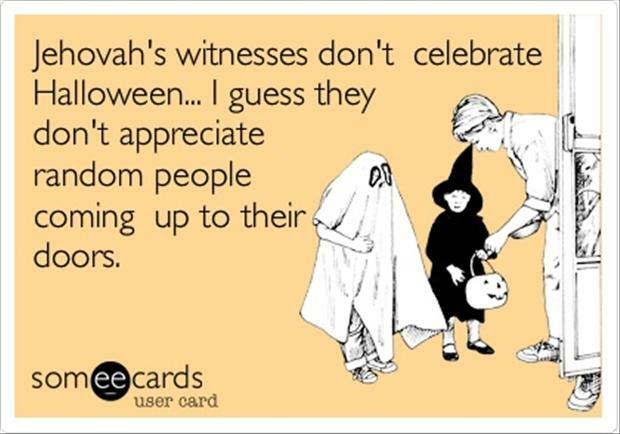 A brilliant theory which makes me want to track down the JW’s that disturb me on lazy weekend afternoons and repeatedly knock on their doors… until they give me some damn candy, of course. And when those treats never come to fruition, you continue to knock and piss them off until they realize what they have been doing for years is just as annoying. I’m not sure why they settled on 1983, but given that was the year I was born, I can only assume I was the one who originally came up with this amazing concept! Halloween is a prevert’s dream and thanks to all the women who dress however they damn well like (women’s lib!!! ), dudes are treated to a visual feast of epic proportions. Smile on, my brothers! I’m learning so much with my research for this post. You could probably put together a couple months worth of TP supply if you just pissed off a few teenagers and let them trash your place. Unfortunately, if those teens chose to go the egging route, you’d have a more difficult time of multi-purposing their prank, unless you had a number of skillets available and could quickly gather up the yolky goop. 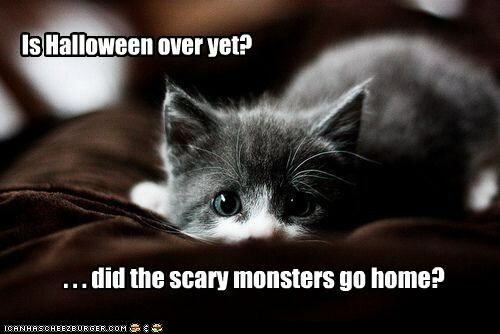 Don’t worry little kitty, we’re almost through the season of ghouls and ghosts… although, that’s not what really sets off our pets, it’s the constant doorbell ringing of Trick-or-Treating kids and the setting off of fireworks and firecrackers. My familiy’s little ones do not enjoy Halloween night. Hopefully they find a good hiding spot to rest through the evening of torture. I hope you enjoyed these laughs and if you see anything you want to send my way to return the favour, by all means, go right ahead! I subbed in Cointreau because I didn’t have the Mango Vodka the original recipe called for and that may have detracted from the drink. The cocktail did taste sort of like a Gummy Worm and the garnishes went over quite well. 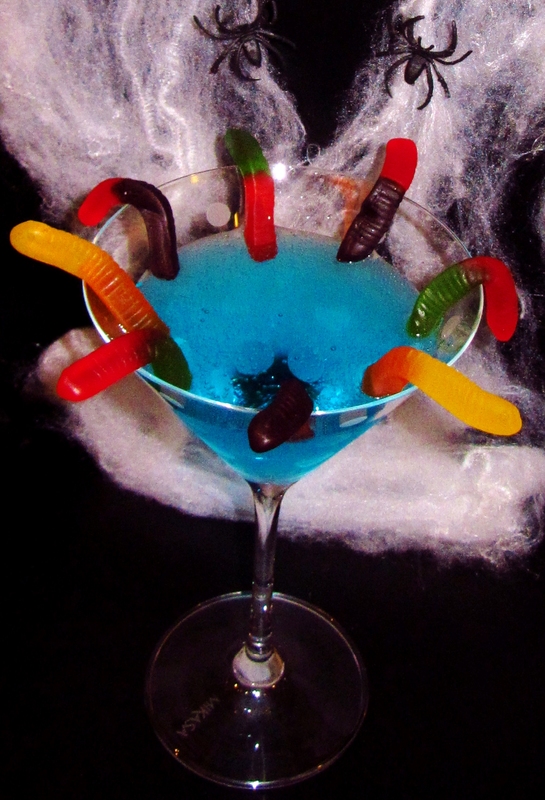 This entry was posted in Martini Recipes and tagged blue curacao, cocktail, Cointreau, Free Toilet Paper, Gummy Worm, Gummy Worms, Halloween Memes, Jehovah's Witnesses, lemon-lime soda, martini, Prank, raspberry vodka, Scaredy Cat, Scooby, Scooby Doo Gang, Shaggy, Slutty Costumes, TP'ing, Trick-or-Treating by Daniel Wilson. Bookmark the permalink.